Chugging along, work going great, being very productive - then I checked my email. The translation agency I'm working with to get my birth certificate French government-ready told me I need to come back so they can get my original birth certificate. The one that they told me they needed. The one I had sent FedEx overnight from California. The one that held up my getting my translation done. The one that, once I went to the office, they told me they didn't need, and that a photocopy would be fine. The one that I now had to leave with them, and HOPE that they still get the translated version back to me by Friday. But hey, what can I do? I can only take these things one step at a time. If there's one rule to staying sane while dealing with bureaucracy is to just laugh it off and take the slings and arrows with grace. 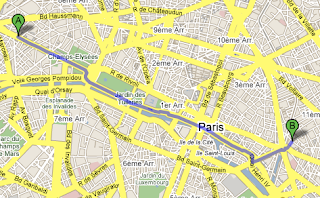 Their offices are on the Champs Elysées. If you live in Paris, this is a place you generally avoid more than picking up dog poop, putting ketchup on your fries, and bathing. It's an upmarket tourist hellhole, and I'm guessing that the only reason this translation agency is there is because most of the new expats decide they want to live around here, the nearby 7th Arrondissement (by the Eiffel Tower), or come here to do all their shopping anyway. It gets something like 3/4 of a million visitors EACH DAY. Which is easily reason enough to avoid it. As if the proliferation of McDonald's and other big chains doesn't do it for ya. But going to the agency here is a trip. And I don't mean the 15 minutes spent on the cruddy Ligne 13, which every time it slowed down, I hoped and prayed it was because it was approaching a station. The agency perfectly illustrates the duality of appearances in Paris. Whereas my apartment is a pretty sweet, nicely decorated pad in an otherwise non-descript, working class neighborhood, the agency's office flies in the face of über-posh Champs Elysées by being one of the most run-down, depressing, claustrophobic offices into which I've ever set foot. It's like something out of a 1940's film noir detective agency, only with iMacs and scanners and photocopiers. Otherwise, it looks like nothing's been updated since the days of the Maltese Falcon et al. I'm imagining all their funds are going to paying the rent. Taking care of my work here, unfortunately, put me on the business end of the evening rush hour commute on the Ligne 1 - an exercise in madness that I'd so recently experienced. So I surveyed my surroundings. The sun was shining, I had my trailrunners on, and - dammit - I live in THE MOST BEAUTIFUL CITY IN THE WORLD. Once again, I decided, it was time for one of my urban hikes. 3.6 miles - not too bad - running from the Champs Elysées, through the Place de la Concorde, down the Jardin des Tuilleries, through the Louvre courtyard, down Rue de Rivoli, through the hip & trendy Marais, up through the Bastille, and on to my place. I had to plow through crowds of tourists. I had to jump over or skip around massive puddles left by the earlier thunderstorm. It rained on me a bit once I got to the Marais, but nothing I couldn't slog through comfortably, and I took refuge toward the finish line with a happy hour beer at my new local. Now I have to catch up on the work I missed in doing all this, but that's fine. I just spent a sunny late afternoon walking through THE MOST BEAUTIFUL CITY IN THE WORLD. And I had a beer. Score!